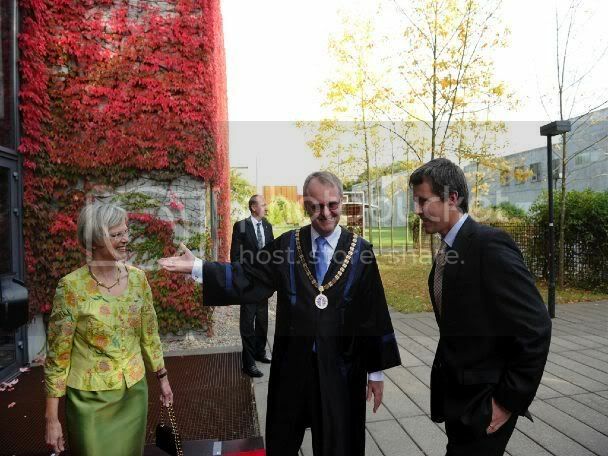 Crown Prince Frederik visited the University of Southern Denmark in Odense for its annual festival on Friday October 3rd. Frederik drove the 2½ hour journey to Odense in his Maserati, numberplate Crown 68, while Mary was still on her working visit to Uganda. 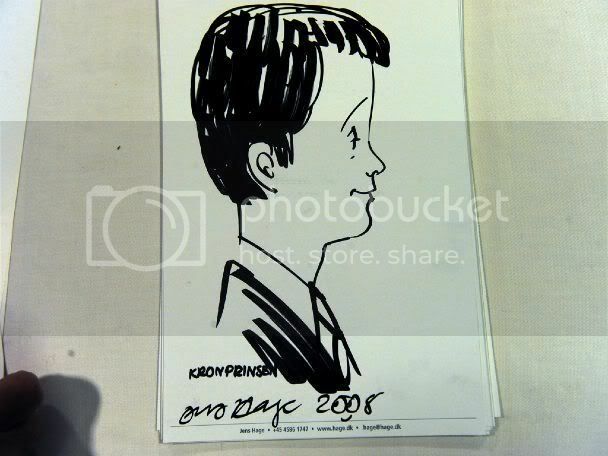 Photos © University of Southern Denmark, including the cartoon of Frederik! The Crown Prince was delayed in the afternoon traffic but participated in the annual festival at SDU. 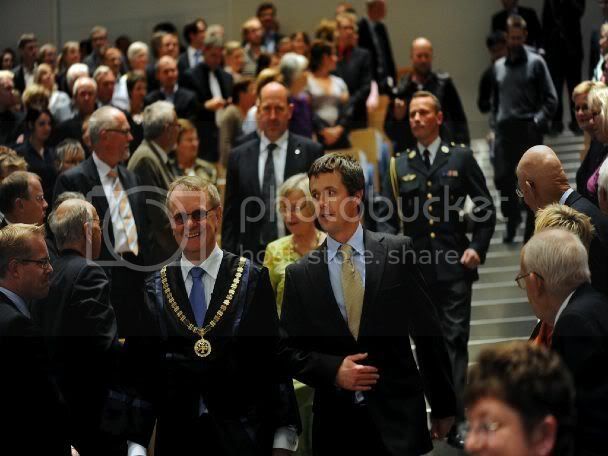 Crown Prince Frederik ran into traffic problems on Friday afternoon on his way to SDU's big annual festival. At the planned arrival time the Crown Prince had only reached Nyborg. That meant that the whole programme was pushed back. Two years ago it was Queen Margrethe who honoured the university in Odense with her presence at SDU's 40 year jubilee. 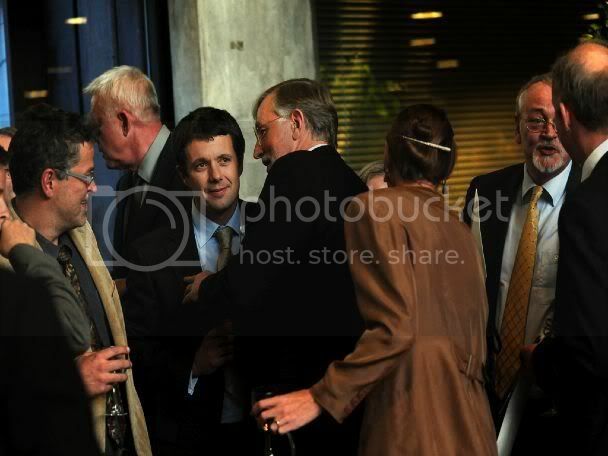 Last year Prince Joachim had the chance to participate in the festivities and this year it was thus Crown Prince Frederik who delivered blue blood to the party. So it has almost become a habit that there is a royal among the 450 guests, 250 of which are specially invited, when principal Jens Oddershede bids welcome to the annual party at the University of Southern Denmark in Odense. The programme offered several more speakers late in the afternoon. 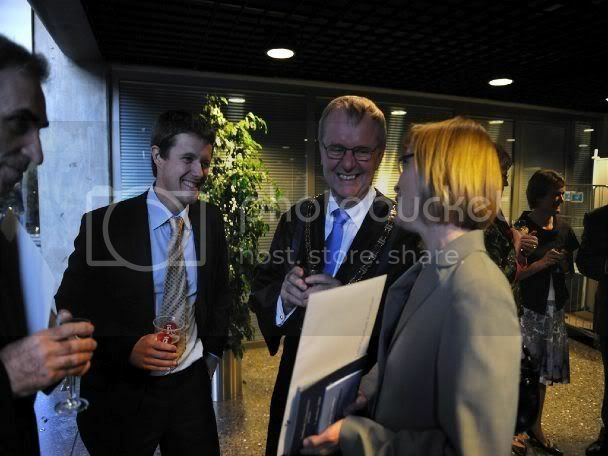 Science Minister Helge Sander was also among the audience in the auditorium. Later there were refreshments for the guests and the university. Odense local Heidi Herløws from DR's show X Factor entertained students on their own without all the big wigs.